This high-end steakhouse is popular for good reasons: elegant but comfortable décor and prime steaks, served sizzling hot with a pat of butter. : Although the Valley is awash in high-end steakhouses these days, this Louisiana-based chain retains its loyal following year in and year out, thanks to its subtle décor, feel-good ambience and corn-fed, custom-aged steaks. 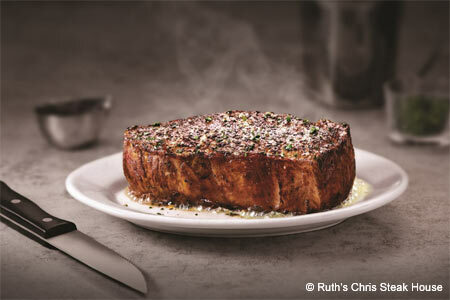 Ruth's Chris broils its juicy USDA prime cuts at 1,800 degrees, topping them with pats of butter and serving them sizzling hot on 500-degree plates. With all that snap, crackle and pop going on --- not to mention the aromas wafting up from the plates --- customer response is generally Pavlovian. For those who can't comprehend such baldly carnivorous cravings, there's lobster, ahi, stuffed chicken and a vegetarian portobello stack. Meanwhile, generously portioned sides such as potatoes au gratin and broccoli with hollandaise are best shared, the better to save room for the good caramelized banana cream pie or espresso-licked chocolate sin cake. Perched on the second floor of the Scottsdale Seville shopping center, this comfortable spot offers mountain views through floor-to-ceiling windows. But in good weather, a table on the luxuriously furnished terrace is the best (and most romantic) place to be. The wine list touches most areas of the globe, with by-the-glass selections in the dozens.